Background: The mechanistic target of rapamycin (mTOR) has been implicated in driving tumor biology in multiple malignancies, including urothelial carcinoma (UC). We investigate how mTOR and phosphorylated mTOR (pmTOR) protein expression correlate with chemoresponsiveness in the tumor and its microenvironment at final pathologic staging after neoadjuvant chemotherapy (NAC). Methods: A single-institution retrospective analysis was performed on 62 patients with cT2–4Nany UC undergoing NAC followed by radical cystectomy. Diagnostic (transurethral resection specimens, TURBT) and postchemotherapy radical cystectomy specimens were evaluated for mTOR and pmTOR protein expression using immunohistochemistry of the tumor, peritumoral stroma, and normal surrounding stroma. Protein expression levels were compared between clinical and pathologic stage. Whole transcriptome analysis was performed to evaluate mRNA expression relative to mTOR pathway activation. Results: Baseline levels of mTOR and pmTOR within TURBT specimens were not associated with clinical stage and response to chemotherapy overall. 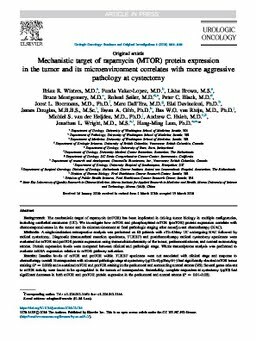 Nonresponders with advanced pathologic stage at cystectomy (ypT2–4/ypTanyN+) had significantly elevated mTOR tumor staining (P = 0.006) and a sustained mTOR and pmTOR staining in the peritumoral and surrounding normal stroma (NS). Several genes relevant to mTOR activity were found to be up-regulated in the tumors of nonresponders. Remarkably, complete responders at cystectomy (ypT0) had significant decreases in both mTOR and pmTOR protein expression in the peritumoral and normal stroma (P = 0.01–0.03). Conclusions: Our results suggest that mTOR pathway activity is increased in tumor and sustained in its microenvironment in patients with adverse pathologic findings at cystectomy. These findings suggest the relevance of targeting this pathway in bladder cancer.